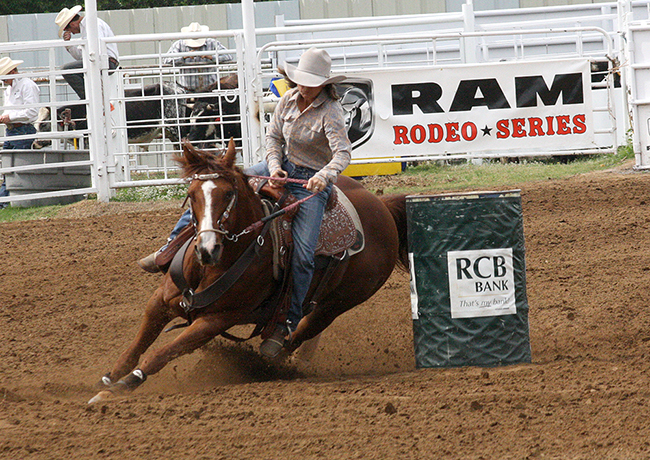 NFR qualifier Jean Winters of Texline, Texas, rounds the second barrel during a recent competition of the Will Rogers stampede. The 2016 edition of the award-winning rodeo will take place next week in Claremore, Okla.
CLAREMORE, Okla. – After months of planning and intense labor around their arena, the organizers of the Will Rogers Stampede PRCA Rodeo are ready for the event’s 70th anniversary celebration. That’s going to be quite a task. The Will Rogers Stampede was named the Professional Rodeo Cowboys Association’s Small Rodeo of the Year in 2014 and ’15, and nearly 550 contestants are scheduled to compete next week in Claremore. Tickets are on sale through the event’s website, www.WillRogersStampede.com, and include family packs and adult passes offered at a significant discount online. The Stampede parade returns, and it begins at 10 a.m. Saturday. The featured Red Dirt/Texas Music acts will be Adam Hood on Friday, Cooder Graw on Saturday and Cody Canada and The Departed to close out the weekend Sunday night. Yes, it is. But there’s no better opening act in Rogers County than the award-winning rodeo, featuring the production and incredible animal athletes from Pete Carr Pro Rodeo, which has been recognized as one of the top five stock contracting firms in the PRCA. The rodeo also will feature the comedy of Gizmo McCracken, who has been nominated as the PRCA Comedy Act of the Year six times. Skydiver Bobby Reid makes his return to bring in Old Glory from the air for all three performances. Many people feel that same way, which is why the local committee has worked so hard to make sure this year’s celebration is memorable.